BALTIMORE (CNS) — Many mornings Carolyn Y. Woo has arrived to the relative solitude of a chapel at the Baltimore headquarters of Catholic Relief Services, and as the bustling city comes to life, she has looked inside the serene space for a particular quiet spot, the place where she arms herself with prayer. “That plant is my coffee table,” she said inside the chapel, pointing to a leafy pot nearby where she hides papers, coffee or whatever she might be holding on her way in. Prayer is something she’s needed while managing one of the largest charities in the country. The days have meant little sleep and lots of meetings, lots of visitors, lots of travel and challenges, joy and sadness, some which she never expected she’d see at the official international humanitarian agency of the country’s Catholic community. The end of 2016 will mark the end of her five-year stint with CRS but also more than four decades of a demanding professional life largely rooted in the halls of business academia and board rooms, and one which led her to the halls of Vatican, as well to the world’s poorest communities. Soon, she’ll be trading that in for drawing classes, piano lessons, line dancing, flower arrangement and trying to learn to speak Spanish so she can sing with others at Mass. The way Woo, 62, sees it, some of the best parts of her life are about to start. “My life always had a set of professional identities: professor, administrator, dean, and so on. … I’m now going to that phase of my life where I’m going to let go of those titles for my most important roles: mother, wife, sister, aunt, friend and a servant of God,” she said. However, when you’re the kind of person the pope has invited to help present one of his most important encyclicals — which Woo did when she helped present “Laudato Si'” in 2015 — it’s hard to just ride off, or line dance, into the sunset. “I’ll continue to serve on several boards. I write a column for CNS, that will continue. There are speeches, but more important, I want to experience and do things that I’m not good at,” she said. For now, she’s busy wrapping up the past five years of her life, reviewing the challenges, successes but also the opportunities of managing the U.S. bishops’ overseas relief and development agency. 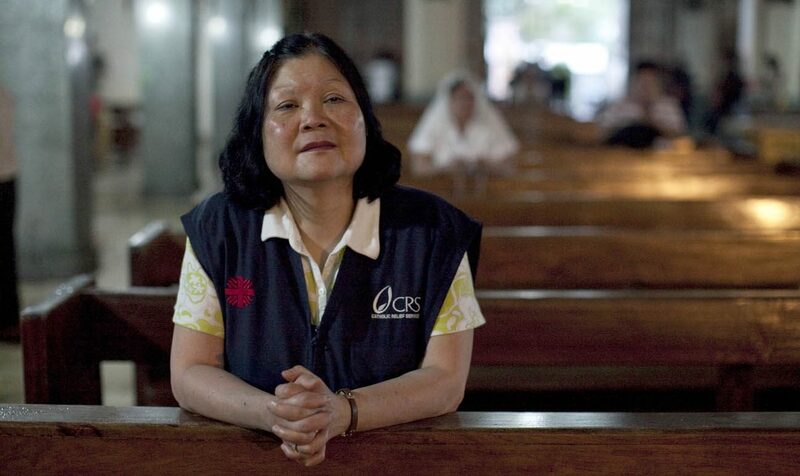 She’s been witness to the work of her colleagues in the 100 or so countries where CRS serves the poorest and most marginalized communities on the planet. She said that while she didn’t know as much as her colleagues about international relief and development when she took over in 2012, she knew about business, especially about strategy, which could help CRS position itself for the future. She comes alive when talking about the intricacies of strategy, how she got students to explore it at the University of Notre Dame when she was the dean of the top-rated Mendoza Business School. She gave up tenure there after CRS tapped her to become its CEO in 2011. At CRS, she has aimed to make the agency a more effective organization, she said, one that develops its leadership from within, one that looks at the short-term and long-term benefits for those it serves, and one that communicates its Catholic identity to the world. “The most important thing to me is that we represent the church well, and that we understand the privilege of being able to serve the people that God sends to us, the people we serve,” she said. That means having enough resources to help alleviate poverty, to respond to increasing natural disasters such as the recent hurricane that swept through Haiti or to the historic displacement of people around the world who are forced to flee their homelands. Her tenure has seen one of the largest displacements of people in history: 65.3 million at the end of 2015, according to figures from the U.N. High Commissioner for Refugees. It surpasses the number of those displaced after two world wars, one which led to the founding of CRS in 1943, as the Catholic bishops of the United States established the agency to help war-torn Europe and its refugees recover. As it did in the past, CRS has helped the present wave of displaced people with basic necessities, as well education and counseling. “The magnitude of the problems exceeds the resources in the world, but it does not exceed our ingenuity and our ability to solve problems, if we can work together,” she said. That’s not an easy task when you consider that most people haven’t come in contact with the displaced, whether refugees or migrants, making it hard to understand what they face, said Woo. Fighting, attacking, labeling, none of it helps to carry out the work of the Gospel, she said, and she’s certainly seen her share of it at the helm of the agency. She remembers a particularly difficult day that began with an email about a blog post accusing CRS of storing and distributing condoms in Madagascar, saying that the bishops there were angry at the agency because Catholic Church teaching prohibits artificial birth control and the agency was violating that teaching. 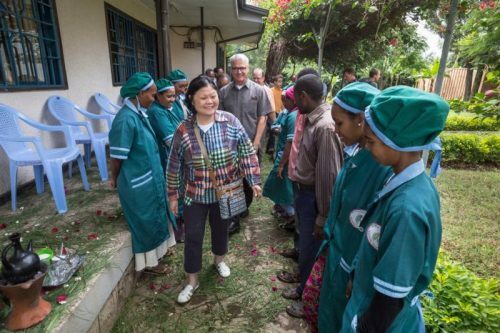 Meetings with the Madagascar bishops, New York Cardinal Timothy M. Dolan, then president of the U.S. Conference of Catholic Bishops, had to be arranged, translators had to be hired, schedules across several time zones had be arranged, all just to clean up a baseless attack, she said. The Madagascar bishops refuted the reports and publicly supported CRS in 2013 but the attacks continued. While attacks may come and go, the mission of CRS remains, she said, and it’s one that began with Christ and will continue when Sean Callahan, the present chief operating officer, takes over the top spot at the start of 2017. 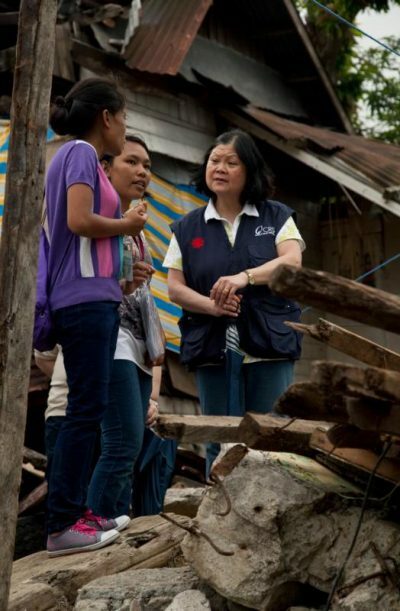 “The mission of CRS comes from the Gospel, which is where Jesus told us to go out serve, particularly raising up those who are without power, those who are without wealth, those at the margins of society,” Woo said. It’s a mission she hopes to continue but on a different path, and one kept in focus by the fleeting images of those she’s met on her CRS journey, of families like hers, selling everything they own to help a son or daughter escape toward a safer or better future, of a young man who reminded her of one of her two sons but lives with shrapnel embedded in his body.